The ethnic Korean minority in China have emerged in recent years as important political and cultural mediators between China and the two Koreas, while also growing more assertive of their own autonomous identity from all three East Asian nation-states. Timed with the inaugurations of the Magpie Series in Modern and contemporary Korea Literature at Kaya Press, this symposium brings together writers, academics, and cultural producers to reflect on the politics of historical and contemporary diaspora of the Korean Chinese and the literary translation of migrant voices. 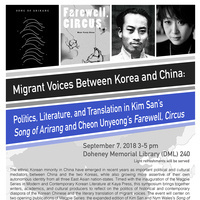 The event will center on two opening publications of Magpie Series: the expanded edition of Kim San and Nym Wale’s Song of Arirang, a biography of a Korean revolutionary in 1930s China, and the first English translation of Cheon Unyeong’s Fairwell, Circus, a rare novel about Korean-Chinese intermarriage. This symposium will feature presentations by Choen Unyeong and Jinim Park, respectively writer and translator of Farewell, Circus, and by the editor of Song of Arirang, Prof. Dongyoun Hwang (Soka University). They will be joined by USC and UCLA faculty and student respondents. This event is sponsored by the Daeson Foundation in Korea, Kaya Press, and several USC institutions: Department of East Asian Languages and Cultures, Department of History, East Asian Studies Center, Korean Heritage Library, Korean Humanities Group, and Korean Studies Institute.